This huge rock near the village of Carlops, in the Pentland Hills, is known as Witches' Leap, or Carlin's Loup. I went to Carlops while I was on holiday in Scotland for two reasons. One was to do a civic duty and recycle some bottles, as there are recycling bins just below the rock. However, my main reason was to visit a site associated in folklore with witchcraft. Someone who lived locally told me that according to legends witches would use the rock to launch themselves into the air on their broomsticks before flying off to their sabbats. A little more research revealed that isn't the only tale told about Witches' Leap. 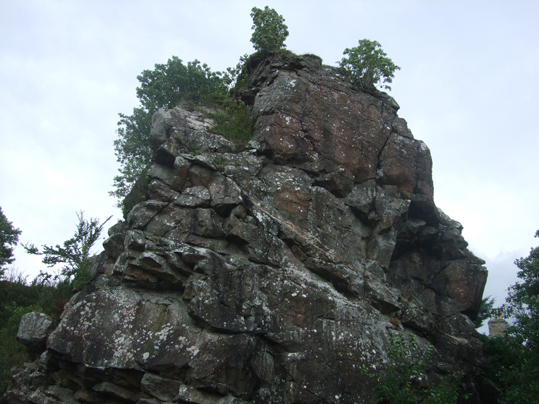 Near the south of the village there are two exposed rock faces about 20 metres in height facing each other with a similar distance between them. Folklore maintained that witches would leap from one face to the other, over the chasm, for entertainment of an evening. A Dictionary of Scottish Phrase and Fable, by Ian Crofton, says Carlin's Loup was a place where people accused of witchcraft were tested by being thrown from the rock. If they flew away, they were a witch, if they fell to their death, they weren't. Sounds like you were much better off being a witch than being not of the Craft in that particular test. Ian Crofton adds that Carlin means an old hag or witch and was also the name given to a doll made from the last sheaf of corn cut during the harvest before the start of winter. 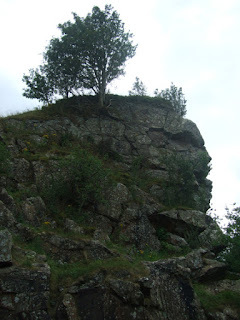 She [The Cailleach] is said to have created a huge amount of the Scottish landscape by wading through the surrounding waters up and down the country dropping large boulders from her creel (apron) to make the islands and using smaller rocks to create the mountains. Some of these are Beinn Chailleach Bheur in Argyllshire, Beinn na Caillich on the Isle of Skye, Loch Awe in Argyll and Bute and mountains in Lochaber. A large furrow down the side of Beinn na Cailliach called Sgriob na Calliach (furrow of the Caillieach) is said to have been created when she stumbled and slid down the hill. Other place names in Scotland refer to her, such as Cailleach Vear – a rock off Mull, Sgeir Cailleach – Jura, Ceum na Caillich – Arran, Cailleach Head – Ross, Carlin’s Loup near Carlop and Creagan Biorach na Cailliche Moire on Lewis to name but a few. When I took the photos, I didn't include the recycling bins or car park at the base of the rock as they weren't that attractive. I did, however, manage to baptise myself in Irn-Bru when I was throwing a bottle that wasn't quite empty in the bin. I'm not sure if that was The Cailleach's doing or just me being a bit clumsy. You can view Pagan Portals – The Cailleach on Amazon and also view A Dictionary of Scottish Phrase and Fable on Amazon.